Superb Belt! Brilliantly HANDCRAFTED IN AUSTRALIA using the finest quality materials. RARE and Beautiful! Here is why: DESIGNER NOTES: * Hip hugging and contoured to provide support and style to the front and back. * Crocodile leather embellishment strategically placed forward of the side hip to provide a maximum fashion statement and exposure. *Provides bold statement and flexibility to every kind of wardrobe and occasion. ARTISAN NOTES: * Green colour on Crocodile skin is the rarest and most sought after, due of degree of difficulty of applying green on the crocodile skin. 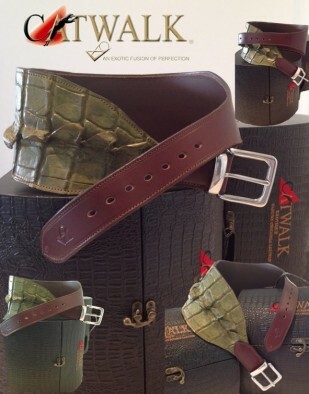 * Finest Crocodile skin hand finished in our signature Demantoid Green. * Leather component: Finest quality AUSTRALIAN Full Grain 3.7 mill. thick leather, hand finished to provide a luxurious light mahogany lustre. An exotic fusion of the crocodile skin in the rarest of colours combined with the best quality AUSTRALIAN full grain leather, meticulously HANDCRAFTED IN AUSTRALIA. (treasure boxes are not included in price) Exclusively Available at Osborne Grace Gallery Marina Mirage.